When you let people participate in the design process, you find that they often have ingenious ideas about what would really help them. And it’s not a one time thing; it’s an iterative process. HCD is a way of thinking that places the people you're trying to serve and other important stakeholders at the center of the design, innovation and implementation process. The HCD approach to problem-solving is iterative, measurable and results-driven. Social impact and development face significant hurdles that stem from the difficulty in changing user and stakeholder behaviors, the barriers to scaling compelling solutions and the challenge of measuring impact. Human-centered design and its sibling design thinking are well suited to tackling these issues. Read more in our publication: Making the Case for Design in Development Sector. Human-centered design delivers value to programs by actively engaging end users, providers and other constituencies throughout the development process to ensure that their needs and expectations inform decisions. Download our poster: The HCD Process. Despite the appeal of human-centered design, organizations often struggle to integrate design methods and outputs. Our integrated approach brings together rigorous analytical approaches with creative, empathetic and participatory methods to inspire better solutions and plans. There are many methods within our integrated design toolkit drawn from HCD and related disciplines. These methods are rigorous and multi-disciplinary, and help us understand needs, design for needs, and engage users and stakeholders. In practice, we routinely draw on related methodologies such as behavioral science, systems design, data analytics, and lean / agile development. 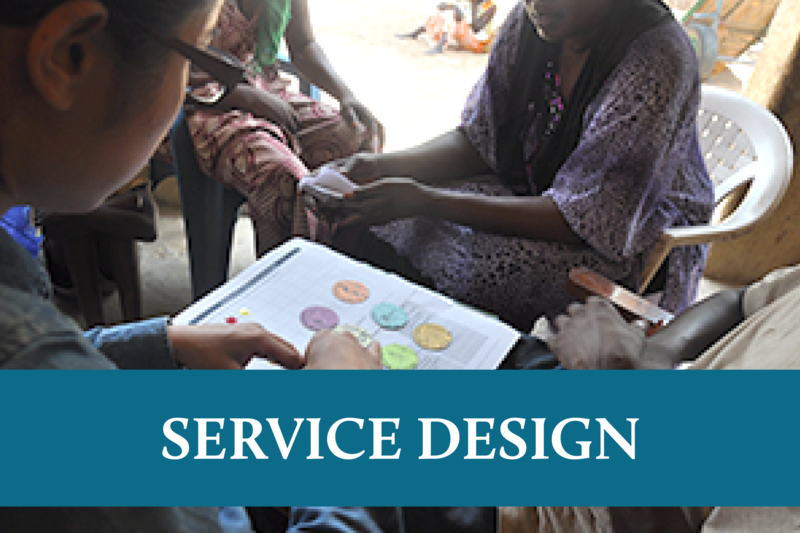 Service design helps maintain a cohesive picture of various touch-points with users and stakeholders so they can better coordinate their activities to deliver value on a consistent basis over time. 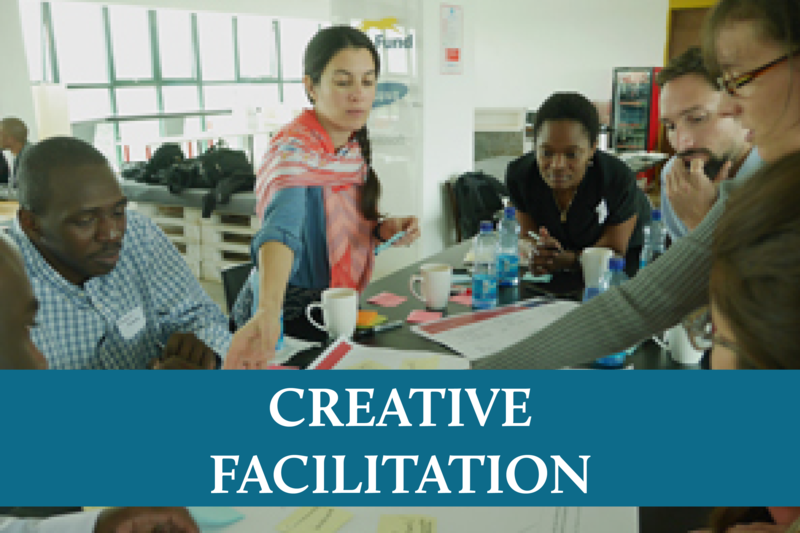 Creative and collaborative methods help engage stakeholders and users, map out new opportunity spaces and align around new agendas, ideas and strategies. System mapping helps visualize dynamic systems that reflect a common understanding of key stakeholders, relationships and feedback loops. This is critical in identifying leverage points and opportunities for collaboration. We use on-site research methods that involve observations and deep-dive interviews, taking place in the contexts and locations in which users (and other stakeholders) live, work and interact. We incorporate behavioral science techniques into our HCD and prototyping approach to generate behavioral hypotheses and rigorously test ideas through experiments. Rapid prototyping accelerates the process for testing assumptions and iterating new product, program or delivery models. It removes risk and increases certainty by engaging users and stakeholders early and often. We leverage big data analytics to complement qualitative research with statistically rigorous insights from market research, surveys and separate data sets, to inform segmentation, business cases and go-to-market strategies. Pilot testing and implementation validates propositions and lowers the risk of failure for a proposed solution. Supported by the right business strategy and incentive models, pilots are an ideal way to measure business impact through small-scale experimentation. We work closely with technology development partners to implement our solutions, using rapid sprint cycles centered on user stories closely tied to our HCD research insights. Provides a more actionable view of opportunities by combining the validity and rigor of quantitative research and analysis with the richness and inspiration of qualitative insights and storytelling. Plans the path to sustainability and scale by creating an environment for learning, experimentation and risk-taking that fits within well-articulated theories of change, strategic plans and operational models. Inspires innovative and concrete solutions by bringing together insights about unmet needs, the policy and regulatory environment, business viability, organizational capability and technical feasibility. As part of the Dalberg Group, Dalberg Design benefits from seamless integration with a range of additional capabilities, including strategy and policy advisory, quantitative research and analysis, data analytics, operational support, measurement and evaluation, innovative financing and incubation. We routinely bring together teams, approaches and tools from across our platform to help our clients achieve greater impact.